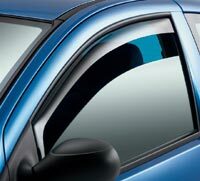 Front window deflector for Hyundai Starex H1 models with electric mirrors from 1998 to 2007 and Hyundai Starex Pickup Libero 2 door models from 2000 to 2007, sold as a pair. SPECIAL ORDER ONLY. DELIVERY 2-3 WEEKS.